Labyrinth is a 1986 American adventurefantasy film directed by Jim Henson, executive produced by George Lucas, and based upon conceptual designs by Brian Froud. The film stars David Bowie as Jareth and Jennifer Connelly as Sarah. The plot revolves around 15-year-old Sarah’s quest to reach the center of an enormous otherworldly maze to rescue her infant brother Toby, who has been kidnapped by Jareth, the Goblin King. With the exception of Bowie and Connelly, most of the significant characters in the film are played by puppets produced by Jim Henson’s Creature Shop. Labyrinth started as a collaboration between Jim Henson and Brian Froud, with ideas for the film first being discussed between them following a screening of their previous collaboration, The Dark Crystal. Terry Jones of Monty Python wrote the first draft of the film’s script early in 1984, drawing on Brian Froud’s sketches for inspiration. Various other script-writers, including Laura Phillips (who had previously written several episodes of Fraggle Rock), George Lucas, Dennis Lee, and Elaine May, subsequently re-wrote and made additions to the screenplay, although Jones received the film’s sole screen-writing credit. Labyrinth was shot on location in Upper Nyack, Piermont and Haverstraw in New York, and at Elstree Studios and West Wycombe Park in the United Kingdom. The New York Times reported that Labyrinth had a budget of $25 million. 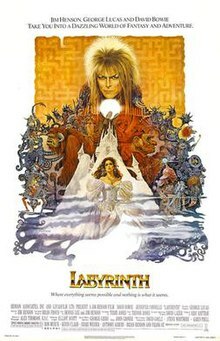 Labyrinth was a box office disappointment and only grossed $12,729,917 during its U.S theatrical run. The commercial failure of the film demoralized Henson to the extent that his sonBrian remembered the time of the film’s release as one of the most difficult periods of his father’s career. It would be the last feature film directed by Henson before his death in 1990. Although it was met with a mixed critical response upon its original release in 1986, Labyrinth has since gained a cult following. A four-volume mangasequel to the film, Return to Labyrinth, was published by Tokyopop between 2006-10. In 2012, Archaia Studios Press announced they were developing a graphic novel prequel to the film. Fifteen-year-old Sarah Williams rehearses a play in the park and becomes distracted by a line she is unable to remember while being watched by a barn owl. Realizing she is late to babysit her infant half-brother Toby, she rushes home and is confronted by her stepmother before she and her father leave for dinner. Sarah realizes that her brother is in possession of her treasured teddy bear Lancelot. Frustrated by this and his constant crying, Sarah inadvertently wishes Toby away by the Goblin King Jareth. He refuses to return the baby, but gives Sarah 13 hours to solve his Labyrinth to find him before Toby is turned into a goblin. Sarah meets the dwarvish Hoggle, who aids her in entering the Labyrinth, but a talking worm inadvertently sends her the wrong way. After failing to solve a riddle, Sarah ends up in an oubliette where she reunites with Hoggle. After they confront Jareth and escape one of his traps, the two encounter a large beast named Ludo. Hoggle flees while Sarah befriends Ludo. After another riddle, she loses him in a forest. Hoggle encounters Jareth, who gives him a peach and instructs him to give it to Sarah, calling his loyalty into question as he was supposed to lead her out of the maze. Sarah is assaulted by a group of creatures with detachable body parts who try to remove her head, but Hoggle rescues her. She kisses him and Jareth magically sends them to the Bog of Eternal Stench as punishment where they reunite with Ludo. Sarah, Hoggle, and Ludo meet the guard of a bridge out of the swamp named Sir Didymus, an anthropomorphic fox and his Old English Sheepdog steed named Ambrosious. After Ludo saves Sarah from falling into the swamp, Didymus joins the group. After the group gets hungry, Hoggle gives Sarah the peach and runs away as it begins to erase her memories. She has a hallucination where Jareth comes to her, proclaiming his love for her, but she resists and escapes, falling into a junk yard. After an old hag called the Junk Lady fails to brainwash her and her memory is jogged, she is rescued by the others and they are right outside the Goblin City where Jareth’s castle is. As they are confronted by the guard at the gate, Hoggle comes to the rescue. Despite his feeling unworthy of forgiveness, Sarah and the others welcome him back and they enter the city together. Jareth is alerted to their presence and sends his goblin army to stop them, but Ludo’s powers to summon rocks helps to turn the tide of the comical battle and they enter the castle. Sarah insists she must face Jareth alone and promises to call the others if they are needed. In a room modeled after an M.C. Escher staircase, she confronts Jareth while trying to retrieve Toby. She tries to recite the line from her play, that has told her adventure to that point, but can’t remember the last line. As Jareth begs her to obey him and he will love her, she remembers the line “You have no power over me!” Defeated at the last second, Jareth returns Sarah and Toby to the real world safely. Realizing how important Toby is to her, she gives him Lancelot and returns to her room. While there, she sees her friends in the mirror and realizes even though she is growing up, she still needs them in her life. In an instant, all of the major characters from the Labyrinth appear in her room for a raucous celebration while Jareth’s owl form watches from outside and then flies away into the night. Jennifer Connelly as Sarah Williams, a 15-year-old girl who journeys through the Labyrinth to find her baby brother. David Bowie as Jareth the Goblin King, the ruler of the Goblins. He brings Toby to his Labyrinth on Sarah’s wish, falls in love with her, and offers to make her his consort. Toby Froud as Toby Williams. Sarah’s baby half-brother. Christopher Malcolm as Robert, Sarah’s father. Shelley Thompson as Irene, Sarah’s stepmother. Natalie Finland as the Labyrinth Fairies, a bunch of deceitful barefoot fairies that reside in the Labyrinth. Brian Henson as the voice of Hoggle, a dwarf in Jareth’s employ who befriends Sarah. Artist Ron Mueck as the voice of Ludo, a kind-hearted beast. David Shaughnessy as the voice of Sir Didymus, a brave fox knight. David Shaughnessy also voices The Wiseman’s Bird Hat, a bird-headed hat worn by the Wiseman. Percy Edwards as the voice of Ambrosius, an Old English Sheepdog. Michael Hordern as the voice of The Wiseman, an aged human-like individual. David Healy as the voice of the Right Door Knocker, a component of the door that is between the hedgemaze and the forest. Robert Beatty as the voice of the Left Door Knocker, a component of the door that is between the hedgemaze and the forest. Kevin Clash as the voice of Firey #1, the apparent leader of the Fireys. Charles Augins as the voice of Firey #2, the first of the Fireys to have their head removed. Danny John-Jules as the voice of Firey #3, the only Firey with a moustache. Richard Bodkin as the voice of Firey #5, the first Firey to make his head jump up and down. Goblins voiced by Michael Attwell, Sean Barrett, Timothy Bateson, Douglas Blackwell, John Bluthal, Brian Henson, Anthony Jackson, Peter Marinker, Ron Mueck, Kerry Shale, and David Shaughnessy. Juggler Michael Moschen performed Jareth’s elaborate crystal-ball contact juggling manipulations. Goblin Corps performed by Marc Antona, Kenny Baker, Michael Henbury Ballan, Danny Blackner, Peter Burroughs, Toby Clark, Tessa Crockett, Warwick Davis, Malcolm Dixon, Anthony Georghiou, Paul Grant, Andrew Herd, Richard Jones, John Key, Mark Lisle, Peter Mandell, Jack Purvis, Katie Purvis, Nicholas Read, Linda Spriggs, Penny Stead, and Albert Wilkinson. Goblins performed by Don Austen, Michael Bayliss, Martin Bridle, Fiona Beynor Brown, Simon Buckley, David Bulbeck, Sue Dacre, Geoff Felix, Trevor Freeborn, Christine Glanville, David Greenaway, Brian Henson, Jim Henson, Brian James, Jan King, Ronnie Le Drew, Terry Lee, Christopher Leith, Kathryn Mullen, Angie Passmore, Michael Petersen, Nigel Plaskitt, Judy Preece, Michael Quinn, Gillie Robic, David Rudman, David Showler, Robin Stevens, Ian Tregonning, Mary Turner, Robert Tygner, Mak Wilson, andFrancis Wright. Find Labyrinth and watch an awesome trailer here. Find David Bowie’s music here. This entry was posted on Monday, January 11th, 2016 at 4:12 pm	and posted in Uncategorized. You can follow any responses to this entry through the RSS 2.0 feed.